October had arrived and along with it the waning summer season in High Sierra. Indian Summer had settled over the state giving us perhaps one more chance at Squaretop for the year. Matthew, Tom, myself and a few others had made a similar backpack trip into the Big Arroyo the previous year, but a 3-4" layer of fresh snow had come overnight to squash that plan. This time we came back minus the others, plus Tommey, for a grudge match. The plan was slightly different in that we would backpack only as far as Little Five Lakes, giving us a shorter pack in and out, but adding some six miles to the Squaretop day. We had all driven separately to the Mineral King TH the night before, spending the night sleeping in our cars or just outside. By 7:30a the next morning we were ready to head out. We took our usual route that we had honed over the years, using the old Glacier Pass Trail that forks off the Sawtooth Pass Trail after the first mile, going over Glacier Pass and then down to Spring Lake. Reaching the pass in about two hours, we found some fresh snow on the north side, the remnants of a small storm that had come through the area earlier in the week. It was more than I had expected, but not enough to be more than a minor hindrance. We followed the use trail down to Spring Lake, around its northern shore, then continuing east up to Hands and Knees Pass. Even with the steep slope I was having an easier time than last year since I had shed a number of unnecessary pounds from my pack that I had brought with me last time. A little more than 3.5hrs after starting out we had reached the top of Hands and Knees Pass where we took a break. It was here that I hoped to talk the others into summiting unnamed Peak 11,780ft immediately south of the pass. It has an impressive class 5 summit block that was climbed by Claude Fiddler by tossing a rope over and climbing hand over fist. Matthew had been interested in it beforehand, but when he spied the additional layer of snow on the north side from which we would climb it, he changed his mind. I had no better luck with the others with my best cajoling, and had to give up the side project. Matthew offered me another option, some class 3-4 summits in the Little Five Lakes area. I had little choice but to accept option B, but truth be told, it sounded interesting, too. From Hands and Knees Pass we dropped down about 100ft and traversed the sandy hillside to the adjacent ridge leading to Little Five Lakes. With the elevation gain done with, we dropped into the basin, picked up the trail coming over Black Rock Pass, and followed it down to the junction at Little Five Lakes. We found the place deserted, the backcountry ranger station closed for the season and not a soul in sight. Now 1p, Tom and Tommey were happy to set up camp and spend the rest of the afternoon lounging about - they had no interest in following Matthew and I around for some minor summits, preferring to save their energies for the main event the following day. After ditching most of our stuff, Matthew and I headed back out with much lighter packs, hiking down the trail towards the Big Arroyo. After about a mile we reached the creek crossing marking our turn from the trail, now heading west up into the basin east of Mt. Eisen. There are vestiges of use trails that can be found on both sides of the creek and we used one we came across to the north for a short distance. At Lake 10,410ft we began angling to the northwest, climbing up into a high meadow found in a south-facing cirque. The two peaks we were after were the highpoints of this cirque, two unnamed summits along the crest of the Great Western Divide between Eisen and Lippincott. Mt. Shirley, the lower of these with the last 50ft reported to be class 4, was to the left and where we headed first. We were happy to find that all the cross-country from the time we left the trail to the base of our peak made for an easy, pleasant stroll, minus the boulders or moraine that could have made it far less so. As we neared the base and began heading up talus slopes on the SE side, I spied a notch on the South Ridge that looked like it might make for an interesting scramble over better rock than that leading to the NE Ridge which seemed like so much talus. I spent almost half an hour climbing to this notch only a few hundred feet below the summit, and thought it pretty decent. The ridge above the notch was more difficult, however, and scan as I might its features, I did not see a safe way up without a rope belay. Inconveniently, we'd left the rope and gear back at camp, but realistically we probably wouldn't have used it anyway in the interest of time. With Matthew somewhere below still, I began a traverse across the SE Slope, heading in the direction of the NE Ridge while looking for a class 3 route up that would keep me from traversing more than 100yds to the easier ridgeline. Climbing to the top by 3p, I was surprised to see a yet-higher summit off to the northwest. Secor describes the SW summit as higher but that must be a mistake. There is a SE and NW summit. The most I found was class 3 getting to the SE summit, so the Smatko class 4 must be on the other one and off I went. Ten minutes later I had made it to the higher summit, and on this one at least, I think Andy's rating is a bit soft. Not really much of what I might consider class 4, but there was some stiff class 3 in places. Three minutes later Matthew popped up near the lower summit on the NE Ridge, and seeing the higher point he was able to save himself the trouble of climbing to the top of the lower one, instead traversing around and joining me shortly. The snow remnants still found on the traverse were not enough to increase the difficultly. Look as we might, we saw no sign of the Smatko register we'd hoped to find here. It's a fine perch with great views to Eisen and Lippincott, but perhaps there'd be one on the higher summit to the NE? By 3:45p we were heading off the summit to begin the traverse to Peak 11,820ft. The traverse between the two was neither difficult nor tedious, class 2 as advertised, and a pleasant enough way to spend 35min. The view from the summit was not appreciably different than the first summit, though I liked the view to Lippincott better as its SE Ridge looks more impressive from the new angle. We found no register here either, sadly. I had told Matthew I planned to continue the traverse along the ridge to the southeast and Peak 11,620ft, a bonus of sorts not exactly on the way back. He had no interest, so in order to save time for which we would be pressed, I continued over the higher Peak 11,820ft without waiting for him, capturing him in a few last photos as he was approaching it while I was heading down. I found the traverse between these two peaks more enjoyable than the one I had just completed. The rock was more challenging and I had a fine time scrambling down much class 3 terrain along the ridgeline, staying close to the top with only minor deviations where a few gaps opened up. There is also a great view looking northeast during the traverse to the Kaweah Ridge and I paused several times to study Squaretop and make sense of the described routes swimming around somewhere in my head. In all I spent just about an hour getting from the highest summit to the top of Peak 11,620ft. This one turned out to have an even better register than we'd hoped to find on the others. The weathered pages dated back to a 1936 Sierra Club party of 16 that included Jules Eichorn. Other entries dated to 1942, AJ Reyman in 1951 and a 1964 Sierra Club burro trip. Still other scraps included a few ascents from the 70s and 80s, the last one from 1989. As there was no pencil in the register and I had none in my daypack, I was unfortunately not able to add my own name to the ancient roll call. I had planned to continue down the South Ridge of Peak 11,620ft, but by now it was growing increasingly late, well past 5p. I took a last zoom photo of Squaretop that might be handy to study the following day before heading down the class 2 SW Slopes of the peak. The Little Five Lakes basin was already steeped in shadow when I reached Lake 10,410ft, the sun having set over Mt. Eisen and the Great Western Divide. I found an alternative use trail on the south side of the creek that I followed back for some distance before losing it, but reaching the maintained trail nonetheless. 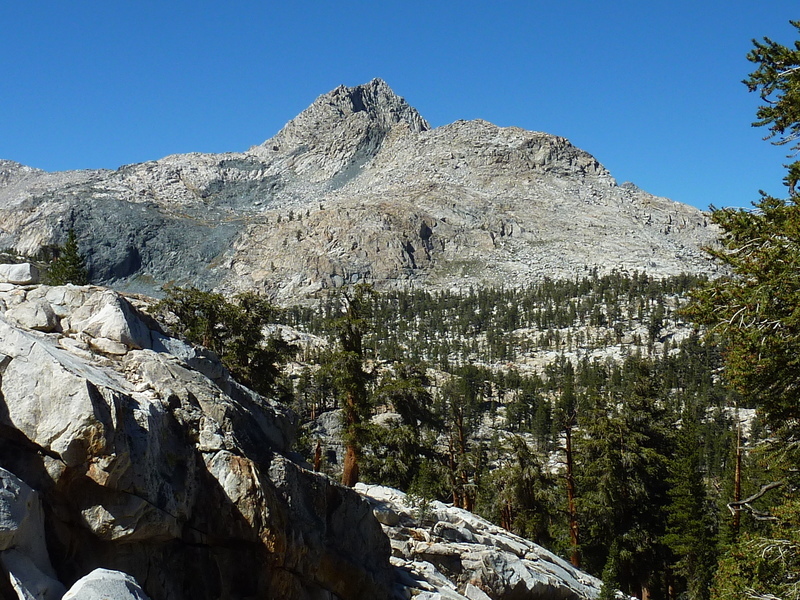 The sun was still shining on the Kaweah Ridge as I hiked back up towards our camp at the trail junction, but even that would be in shade when I arrived back around 7p. Matthew had come back some time earlier and the others had already eaten dinner and bundled up for the chill that was settling over camp. Finding my headlamp batteries near dead (the sort of thing you'd expect an experienced backcountry visitor to check beforehand), I was pressed to use what little daylight remained to shower, set out my sleeping bag, eat dinner and clean up.